The clocks have gone back and it’s the first running weekend of November which means that the road races and track and field move to one side as the cross country and the various winter trail race series take centre stage. It’s been a busy weekend for Springwell RC with events in Ballyclare, Garvagh and Belfast as well as the usual selection of Parkruns. On Saturday 4th November the 83rd McConnell Shield XC, hosted by East Antrim Harriers too place in Sixmilewater Park in Ballyclare. This long established event incorporates both junior and senior races. The event started with the U14 Boys and Girls 1 mile race, which was won by Charlie Curley (Mid Ulster AC) and Kirsty Foster (East Down AC) in 5.41 and 6.16 respectively. The U16 2 mile race was just as competitive, with Gavin McCaffrey (Ballymena & Antrim AC) winning the Boys race in 11.28 and Bethany Nixon (Dromore AC) taking the Girls title in 12.46. The Senior and Masters event was closely contested between Gideon Kipsang (Derry Track Club), Conor Duffy (Glaslough Harriers) and Mark McKinstry (Belfast Harriers) throughout the five mile race and it was Gideon who edged victory in 26.40 with Conor second in 26.48 and Mark third in 27.27. Mark’s performance and that of his club mates John Black, Eamon White and Nat Glenn secured the McConnell Shield for North Belfast Harriers. Laura Bickerstaff (Dromore AC) continued her excellent recent form with a well-deserved victory in the Ladies 3 mile race, finishing in 18.19. Sarah Lindsay (North Down AC) was second in 18.34, with Paula Worthington (Ballymena Runners) crossing the line in 19.03 in third place. The Vet60+ Men’s race was run as part of the Ladies 3 mile event, and it was respected coach and athlete Matt Shields (North Belfast Harriers) who led the way finishing second overall and first in the M60 age category with a time of 18.29. Eric Montgomery (Lagan Valley AC) finished in 20.09 for second place, while Vet70 World Champion Jim Patterson (Newcastle AC) again showed his form with a third place finish in 20.18. On Saturday 4th November local events management company ‘Born 2 Run’ welcomed over 800 athletes to the opening race of their ‘Run Forest Run’ Series, the Minnowburn 10k. Starting and finishing on the Mary Peters Track the course took competitors along the forest trails and paths surrounding the home of Athletics Northern Ireland. The 10 event saw Kent Swann (North Belfast Harriers) win with a time of 36.53, well ahead of second placed Vincent McKenna (QUBAC) with Colm McGarry (Belfast Running Club) third in 38.59. In the ladies race Amy Bulman (Willowfield Harriers) continued her recent good form to win in 39.22. Cathy McCourt (unattached) took second with a time of 39.52. Judith Lonnen (City of Lisburn AC) completed the podium finishing third in 40.26. Mark Harvey (Belfast Running Club) won the mens race in 18.05 with Jared Martin (Scrabo Runners) second, 18.16 and Steve Briggs (Belfast Running Club) third with a time of 18.55. Sunday the 5th November saw the return of the popular Northern Velocity Trail Race Series, with the 5 & 10k races in Garvagh Forest. The early heavy rain, which made for a muddy run around the forest tracks, abated shortly after the 150 competitors started the race. In the 5k event the men’s race was dominated by Andrew Gordon (Springwell RC) who led from the start to win in a time of 17.46 with club mate, Chris Denton (Springwell RC) second in 18.16 and Marty Ross (Bolt) third with a time of 19.34. The ladies race was won by Lisa Simpson (Acorns AC) who finished in 22.05. Charlotte Conerney (Springwell RC) was second with 24.47 and Florence Campbell (Dub RC) third in 25.09. In the 10k event Rhodri Evans (Springwell RC) won convincingly with a time of 37.40. Michael Sinton (Lisburn Triathlon Club) was second with 38.27 and Seamus Bradley (unattached) third with 38.59. In the ladies event Ciara Toner (Springwell RC) continued her excellent form winning the ladies race, and finishing 5th overall in 39.31. Helena Quinn (Termoneeny) finished second with a time of 42.47 and Veronica Nellins (unattached) completed the podium in 44.33. 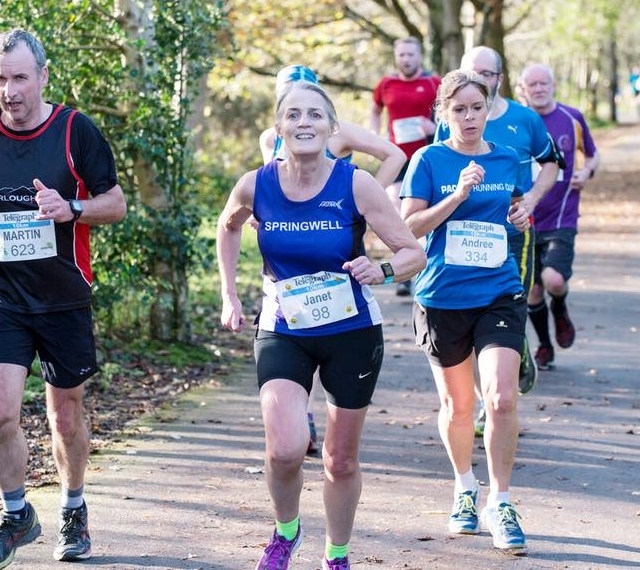 Saturday 4th November saw 58 Springwell RC members taking part in Parkruns at eight different venues five personal bests being recorded. Becky Coulter was the furthest travelled of our Parkrunners, taking part in the Western Springs Parkrun in Auckland New Zealand. Closer to home Pam Howe celebrated her 100th Parkrun on the east strand in Portrush.